Interesting article in the Boston Globe this morning about how, for some (many, actually) being vegan is easier said than done. No kidding. I would never, ever suggestion doing it cold turkey (cold tofurky?). If you’re going to give up all animal products, I don’t suggest doing it after a night of burger binging. Why all the interest in becoming vegan? It’s trendy. Just like chocolate-covered bacon is trendy. The interest will pass. “Meat” is bad for the environment. To the people who give that as a reason I say this: Put down the Big Mac, stop eating at the places where the Sysco truck stops, and go get yourself some meat raised locally and sustainably. Same goes for the McFish sandwich. It’s better for your health. I’m no doctor, but from what I hear, I tend to agree that a diet with fewer animal products is likely better for you. For me, I feel better. Really. If you think about the way humans evolved, we “gathered” food – seeds, nuts, plants and such – until someone in the clan could come back with a mastodon. Then it was eaten slowly over a period of time. I.e. they didn’t gorge themselves on mastodon and then go out and get a double mastodon with special sauce and a super-sized side of fries. HOWEVER, there’s certain vitamins and nutrients you need and gain easily from a diet that includes meat and dairy. No meat and dairy? You have to work a little harder at obtaining those nutrients. And, popping pills isn’t the best way to go about it. I’ve written about being “veganish” before; i.e. two out of three meals without animal products (yes, fish are animals). I started this back in March or April, fell off the wagon a bit during the summer, and have started the veganish thing again about four weeks ago. And you know, it’s not all that difficult. I stick with a vegan breakfast and lunch and add some fish/dairy protein at dinner – a sensible addition of cheese to a dish, or some fish or shrimp. Last week I was about to eat my arm off before I could grab lunch – usually my indicator that I am in desperate need of protein – so I grabbed a boiled egg. I made up for it with a vegan dinner. Longtime vegans will say I’m not a vegan. And they are absolutely right. I’m not. On the other hand, some folks may say I’m not taking into account the environmental impact of raising animals or fishing the oceans, and the animal’s own welfare. And to that I say, I’m working on it. For example, we just signed up for a CSF share—that’s Community Supported Fisheries—through Cape Ann Fresh Catch. No more shrimp from Thailand. We’ll be supporting our local fishing industry. That means local communities and local people. And we are getting more and more localized when purchasing our dairy, too. One last note: This whole veganish thing? Out the window once we get our farm and can raise the animals ourselves. Leaves falling from trees, temperatures dropping, plants succumbing to the elements, days shortening … The world as we’ve known it these last few months is coming to an end. We must eat as many fresh tomatoes and as much basil as possible. Our world is collapsing. Eat tomatoes and basil while you can. I’ve taken up that challenge, gladly. Who wouldn’t? Fresh tomatoes and bright bristly green basil is the ultimate garden combination, really perking up the mouth with the pairing of acid and mellowness. I don’t have to describe it—you know all too well how delectable the two are together. 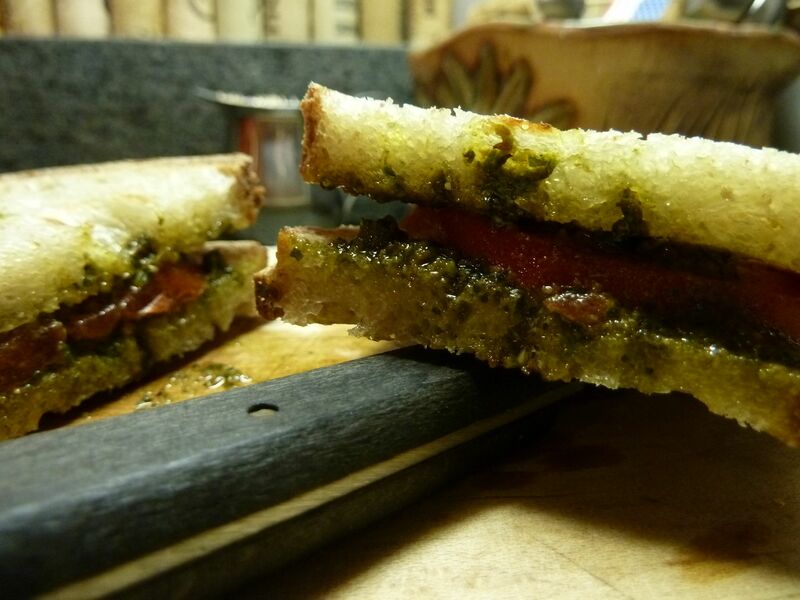 Maybe one of the simplest pairings of tomato and basil is in a sandwich. I know, it’s not really a recipe. It’s more of a lunch suggestion. 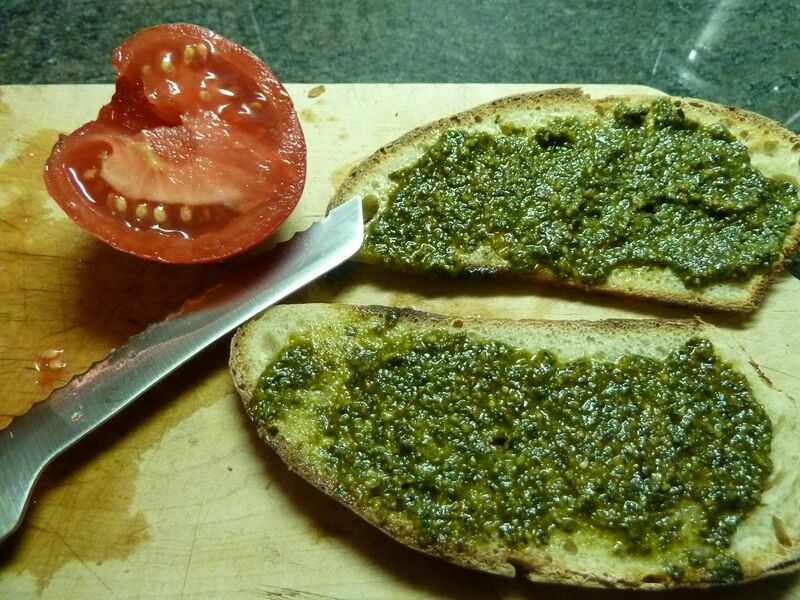 And if you’re like me and disregard the miniscule amount of Parmesan cheese in pesto, tomato and pesto on toasted sourdough becomes a vegan meal. The tomatoes—homegrown. 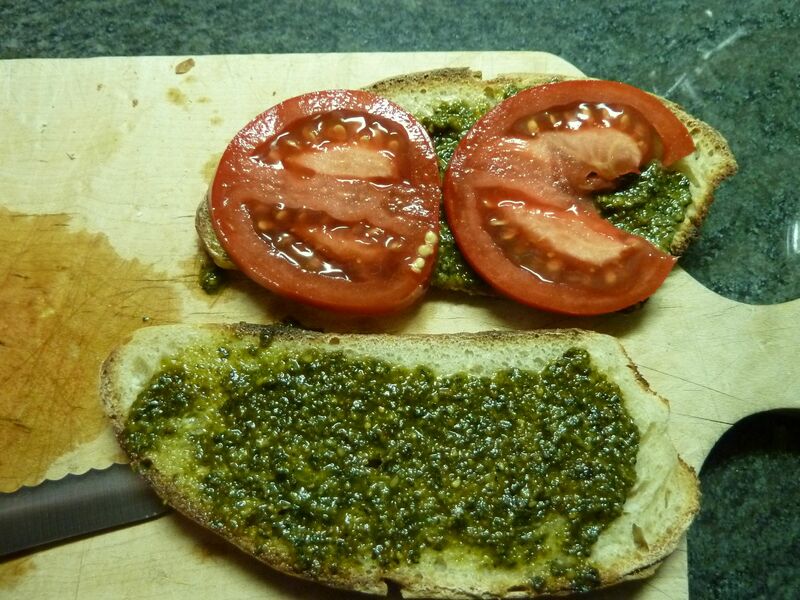 The pesto—homemade, with the added “yeehaa!” of the basil being homegrown. The sourdough—made by my own two little hands. Want to share lunch with me? There’s enough here for at least five more sandwiches. Kinda looks like a big smiley face, don't it? Several weeks ago I attempted my first-ever Indian-spiced meal. Cauliflower masala. Turned out pretty well—read about it HERE. That was then followed by a chana bateta from the Brooklyn Eats blogger, not blogged about here but really tasty. That one includes potatoes in a homemade tomato-based curry. From those two recipes I figured if you have some mustard seeds, cumin, coriander and a touch of heat—and a whole bunch of other stuff—you can whip up a curry. Last night’s meal is what I’m calling Dainty’s Concocted Curry. I had 2/3 cup of coconut milk I needed to finish off, and I didn’t have all the ingredients for either of the above recipes, so I kinda/sorta combined the two. Believe me, it can be tweaked here and there, especially in the heat department. But I’m pretty proud that I even attempted getting jiggy with these East Asian flavors. -Heat oil in a fairly deep fry pan, medium heat. Add shallots and garlic. Move ’em about in the pan now and then and you’re looking for them to be a bit translucent or, better yet, wilted. At this point I just grate the ginger right on top of that, guesstimating a tablespoon’s worth. -While this is happening, put the mustard seeds in a small skillet with a slight amount of oil and heat on med-high. Cover! These seeds will start popping when they are ready – not long, about 3 minutes. 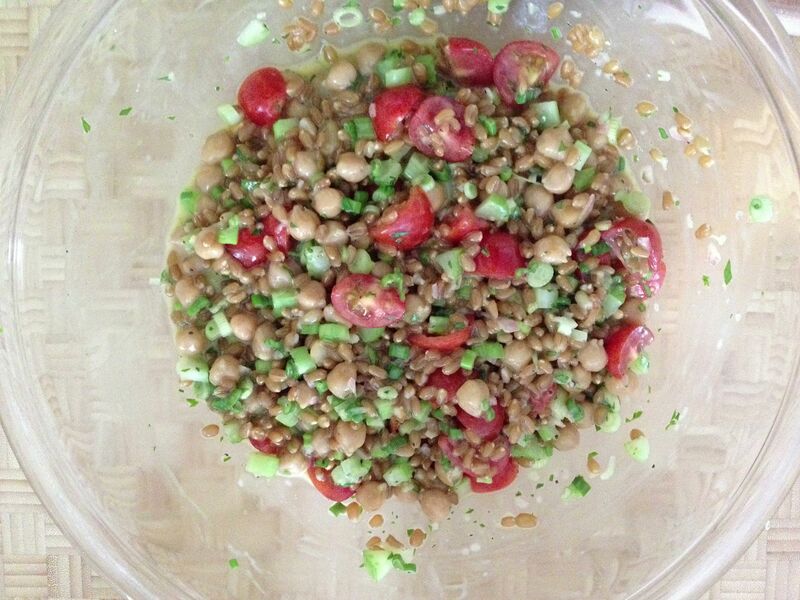 -When shallots/onions/ginger are done, add mustard seeds and all the spices to the mix. Stir about – it’ll be kinda pasty. You just want to get some heat on them to begin releasing their aromas. Doesn’t take long – a minute or two. -Now, this can of whole tomatoes—one recipe called for one diced tomato, the other for a 14 oz can diced tomatoes. Other than a handful of cherry tomatoes, all I had was this 28 oz can of whole tomatoes. Open the can, reach on in there and grab one or two tomatoes, hold it over the pan and squeeze—carefully, otherwise it’ll squish tomato juice all over you. Do this for the entire can, then add the juice. And also add the tomato paste‚—that’ll help thicken it. Add coconut milk and stir. Give it a taste and see if you need to add salt or anything extra. Since I added way more tomatoes than I needed, I gave the mix a few extra shakes of all the spices except the cayenne (no more left) and the mustard seeds. Bring to just about boiling, then turn down to simmer and thicken. We had this on low while our brown rice was cooking for 45 minutes. Stir now and then and check up on it. We’re pretty much done at this point. We did a take-out sorta thing with this when it came to assembling the meal. I roasted some broccoli and also baked some marinated sliced tofu. 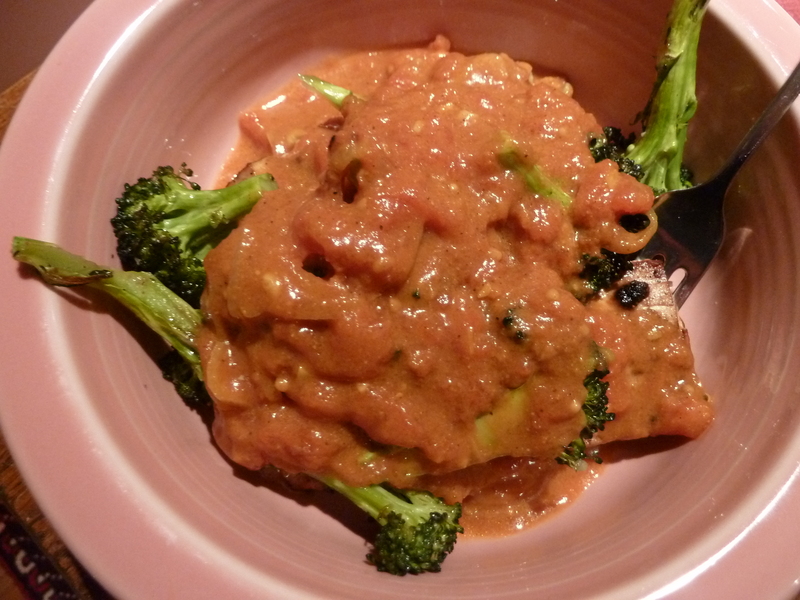 We put a big spoonful of brown rice in a salad-sized bowl, added some of the broccoli and a few tofu slabs, and then spooned the curry on top. Not too bad, I have to say. You? You can add some cubed potatoes (as in one of the original recipes) and let those cook away while the curry is simmering. Or, maybe add some mushrooms. Maybe some stir-fried chicken. Steamed veggies. It’s a curry, and you can use it to add a little East Asian flair to your Wednesday evenings without leaving the house. Will spring ever get here? 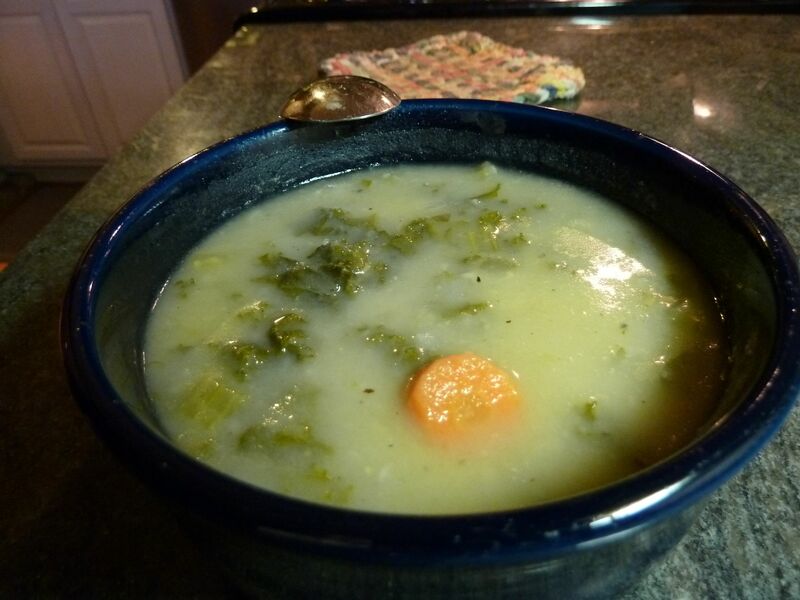 Until it does, one of the ways to deal with cold and damp weather is with hot soup. Hot, hearty soup. This is one of our favorites in the hot and hearty category. It’s “double” mushroom because it uses both fresh and dried mushrooms. Adding the dried gives the soup its earthy heartiness. 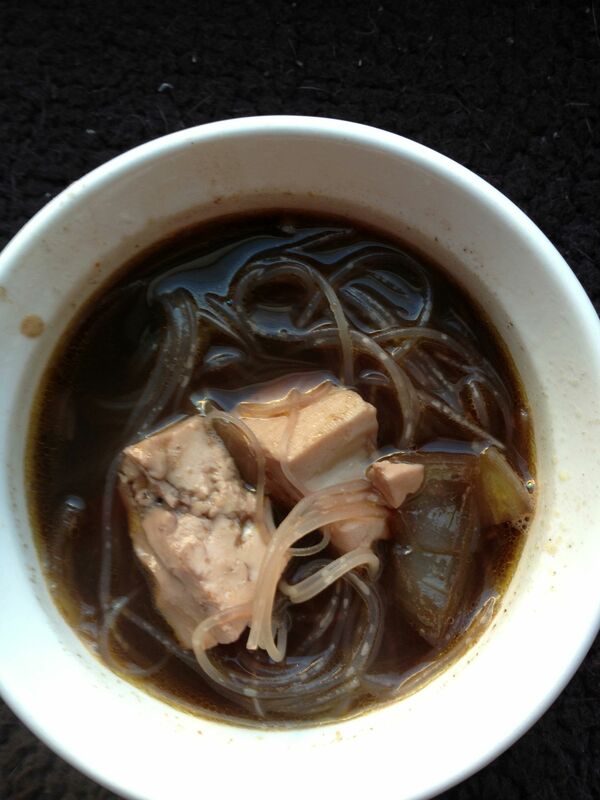 This is another recipe Jennifer acquired from a soup class several years ago. Note on the bottom says it’s from the Great Vegetarian Cooking Under Pressure book. Ah, yes, “under pressure.” This is made in a pressure cooker! Have no fear, people—pressure cookers won’t explode on your stove top. And if you don’t have a pressure cooker, just cover and simmer for … well, I’m not sure. Just keep checking to see if the barley is toothy. -Put dried mushrooms in a medium bowl. Add about 2 cups boiling water. Cover with plastic wrap and let steep for 15 minutes. -Now, for the “6 cups boiling stock” – set a pot of about 4 cups stock (veggie is good, chicken is okay if you don’t have veggie) to boil. You’re going to add the mushroom liquid to it when those are done steeping. -While the mushrooms are steeping is a good time chop your veg. 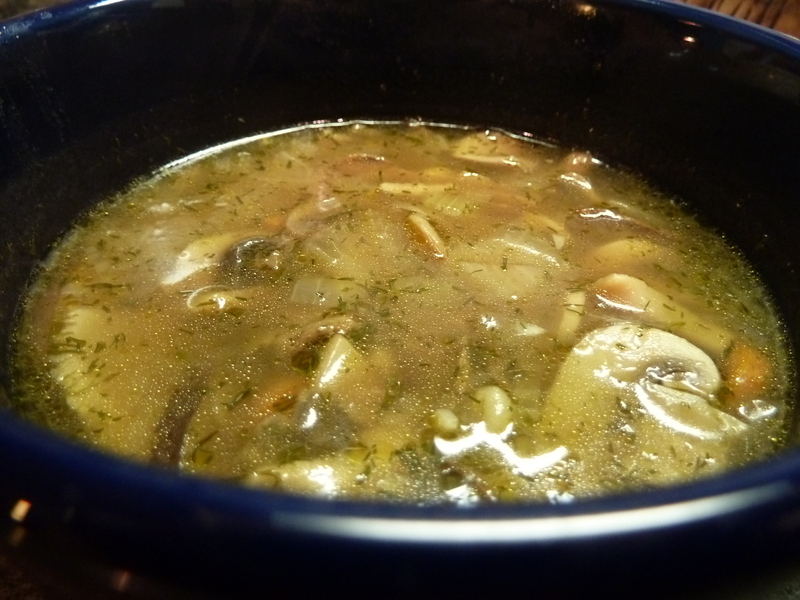 -When mushrooms have steeped, drain the liquid into a measuring cup. You should have a bit less than 2 cups. Just add water to fill up to 2 cups. Add to the pot of stock. Reserve mushrooms. -Heat oil in the bottom of the pressure cooker (or soup pot if not using a pressure cooker) to medium-high. Add garlic and onions. Cook for 1 minute, stirring so they don’t stick. Add the stock and then invite everyone else into the pool! -Lock the top onto the pressure cooker. Bring it up to high pressure, then lower heat to maintain that pressure. Let it cook away for 18 minutes. Then, remove pressure cooker from the heat and place it under cool running water to bring the pressure down quickly. Remove the lid, being sure to face it away from you. You don’t wanna get hit with a cloud of steam! -IF you’re not using a pressure cooker, bring the soup to boil, cover the pot but leave a little crack, and then turn it down a bit to simmer. Let it bubble along for … let’s say 35 minutes and then check every 5 minutes or so until you feel the barley is cooked. -Discard the bay leaves. Add a bit more salt and pepper. In my opinion it needs more salt than you’d think. 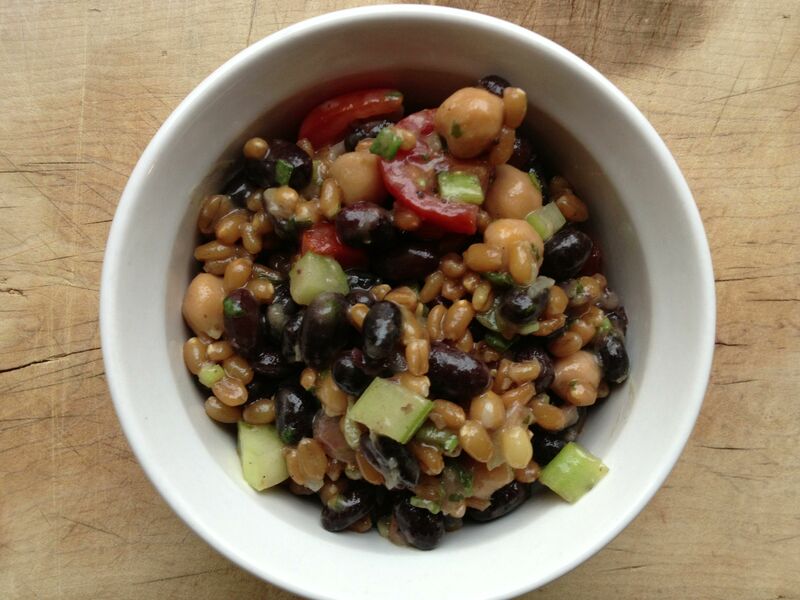 -With barley in there, it’s going to thicken up, especially after being in the fridge for a day or two. Just be aware. If you want, add some stock or water to thin it out a bit. I kinda like the soups that turn into stews the next days. 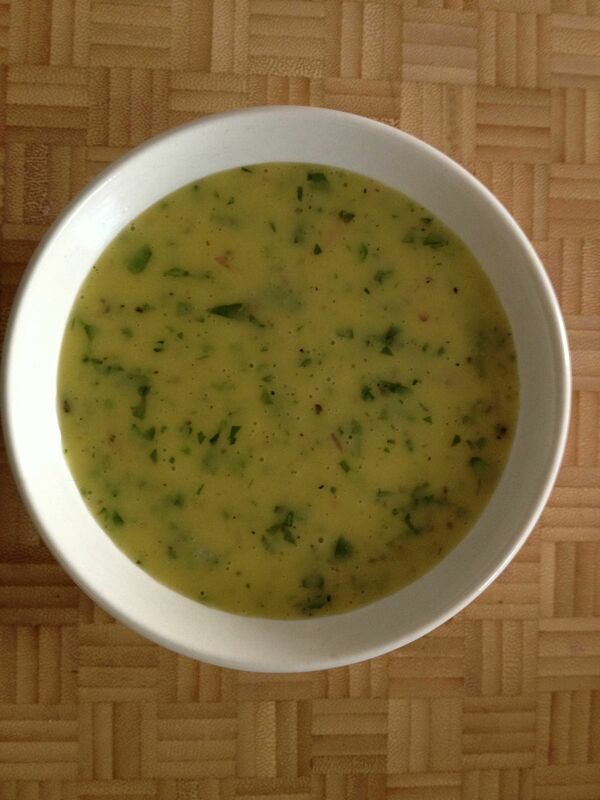 It’s one of those soups that is dinner-worthy if you pair it with a salad or suitable for lunch with some toast. In fact, it’ll be my vegan lunch in about 3 hours. You are currently browsing entries tagged with vegan at The Dainty Dot.